The Dalvina winery is located in the Strumičko-Radoviški wine region of Macedonia in the village of Hamzali (Хамзали), about a 15 minute drive northeast of Strumica. Delčo and Lidija Baltovski, the founders, established the winery in 2007 and from the very beginning of the design process, they envisioned a system from vine to bottle that was eco-friendly and sustainable. The winery is located in the vineyards and workers from nearby villages harvest the grapes by hand. The reception area for the grapes, where the workers further sort and clean the grapes while on the conveyor belt enroute for destemming and then crushing, has been built at a level higher than the rest of the equipment (tanks and etc.) in the winery. This use of gravity during the various stages of the wine making process saves on electricity, increases the efficiency of the winery and decreases the “handling” of the grapes. The use of skylights in the roof of the winery provides for great ambient and natural lighting. 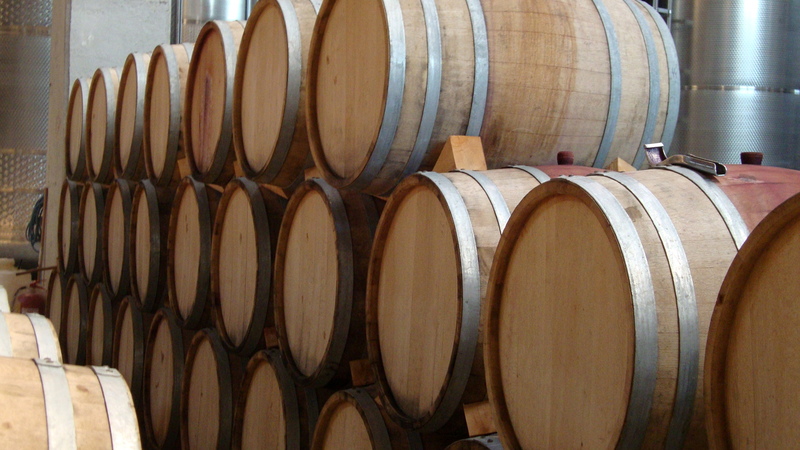 Dalvina uses the délestage (rack and return) wine making process for red wines. The tanks are filled with the crushed grapes and after a short time the fruit pulp, skins and seeds gravitate to the top of the tank and form a “cap”. After the cap has been formed, the wine is then pumped from the bottom of the original tank and put into another temporary tank, leaving only the “cap” in the original tank. Now, the cap is filtered to remove the grape seeds and then wine from the temporary tank is rejoined with the pulp and skins to ferment. The result is wines with more stable and enhanced color, less harsh tannins and fruitier flavors. The Mediterranean climate here that has made the area famous for its tomatoes and peppers combined with choice soil conditions has provided environs exceptionally suitable for the cultivation of grapes. Dalvina owns and operates over 370 hectares (914 acres) of vineyards with some of the vineyards being more than 30 years old and others being newly planted. The older vineyards produce indigenous Macedonian varietals such as Vranec (Вранец), Župljanka (Жупљанка), and Rkaciteli (Ркацители). The winery has a capacity of 4.2 million liters and has infrastructure in place for further expansion. Currently, the winery produces wine for the local and regional markets and exports to Australia, Canada, China, Germany, Japan, Norway, Poland and Switzerland. For white wines, Dalvina produces Chardonnay, Chardonnay Barrique, Riesling, Sauvignon Blanc and two others from indigenous grapes, Župljanka (Zhupljanka) and Rkaciteli (Rkatsiteli). The high acidity in the Rkaciteli grapes provides for refreshing citrus notes in the nose and crisp green apple (not too tart) on the palate. Their Astraion, a barriqued white wine made from the Župljanka grape, also known as Chasselas Blanc, is a full-body, crisp, dry and fruity wine. Dalvina’s premium line of red wines from single varietals is called Tiver and the soon to be delighted wine enthusiast has a choice of Cabernet Sauvignon, Merlot and Vranec. Their use of the délestage technique is evident in the vivid colors, fruity aromas and complex palate. A favorite and a must try from the Dalvina wine selection is the cuveè, Ar-magedon. Ar-magedon is a superb blend of Cabernet Sauvignon, Merlot and Vranec that is aged 18 months in oak barrels. Superb craftsmanship is found in their Godsin line of wines made from the Muscat Trollinger (Muscat hanmburg, Black Muscat) grape. Normally, this varietal is used as a table grape or for making rakija in Macedonia. Dalvina has mastered a process for making two wines from the Muscat Trollinger, one is a semi-dry rosè and the other is a ruby red that is ready to astound.